Public–private partnerships (PPP) consist of at least one public and one private actor. The private actor may be a for-profit organization, such as a business, but can also be a nonprofit organization. 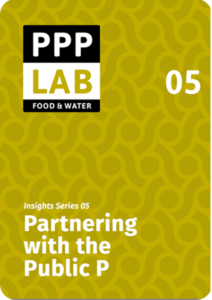 In this publication, we focus on understanding the first ‘P’: the public partner. As public-actor engagement is generally assumed to be crucial for the sustainability of the PPP intervention, it is important to understand the implications of this involvement. Understanding the Public P can support a more effective way of partnering with the Public P. This publication thus supports individual organizations, as well as partnership consortia that aim to reflect on possible partnering strategies with the Public P.
This publication targets partnership practitioners who aim to better understand the nature of the Public P and its associated implications for effective partnering. By providing guiding Partnering with the Public P questions, individual organizations, as well as partnership 7 consortia who are interested in partnering with the Public P, are supported in reflecting on why and how to partner with the Public P.